If you find yourself running low on funds and ideas for fun while on your weekend trip to London, you won't have to look far for some great activities, exhibits, and attractions that are completely free on Sunday. While some museums and shops are closed, a great number of them operate on Sunday trading hours, which restricts the time they can be open to just six hours. This means that while you could spend the day browsing through one of London's street markets, you'll just have less time to do it! From getting a bit religious by attending church at St. Pauls' Cathedral to working on your fitness by taking a self-guided tour of historic neighborhoods, there's plenty to do in London on a Sunday that won't cost you a pence. On Sundays at Hyde Park, large demonstrations are held weekly celebrating free speech in England near the Marble Arch. Although the area of the park known as Speaker's Corner was significantly reduced in 2013, free speech advocates still use this area to challenge political leaders in the country. If you're passionate about social justice, this free weekly event is the perfect way to tap into the local political discourse. Mudlarking, the act of visiting the River Thames at low tide and searching for trinkets on the exposed banks of this tidal river, was considered a profession in London until the early 20th century, but it still makes for a great hobby on any day of the week. If you're looking for something that might actually make you a little bit richer, check the tide tables for the Thames and then spend the afternoon mudlarking the shores. Whether you're religious or agnostic, there's no doubt about the wow-factor involved in attending a Sunday service at St. Paul's Cathedral or Westminster Abbey, both of which are free and open to the general public. If you go to St. Paul's, you could also visit the roof terrace at One New Change for free and enjoy the views of the cathedral dome. Take a walk and see a new neighborhood with one of the many downloadable walking tours, or leave your technology at home and print out the Street Art Walking Tour Guide or the Little Venice to Camden Regent's Canal Walk, which is an incredibly peaceful way to see London. For a bit of extra thrill on your Sunday, the Sweeney Todd walk in east London is a good introduction to the gruesome tale. Nearly all national museums across the U.K. are free for visitors on any day of the week, which means you have plenty of choices in London. Try somewhere different such as the Horniman Museum in south London or enjoy the Museum of London and stop by Postman's Park, too. If you're happy with crowds, head to South Kensington for the big three museums which can get incredibly busy at the weekend. The Natural History Museum has the longest queues, and although the V&A can be a bit calmer, the Science Museum is generally less crowded above the ground floor. The time-honored tradition of the Changing of the Guard of the Queen's Guard has been a part of life for the royal family since 1666, and when Queen Victoria moved to Buckingham Palace in 1837, the tradition moved along with her. Offical Changing of the Guard ceremonies, which are often accompanied by music, take place Mondays, Wednesdays, Fridays, and Sundays, but be sure to check the full schedule as rain and holidays may cancel or delay these ceremonies. Also, if you're in the area a little later in the day, don't miss out on the daily Four O'Clock Parade. London is an incredibly green city so enjoy London gardens such as Kensington Roof Gardens or one of the royal parks such as St James's Park. In north London, you can enjoy the views from Primrose Hill or the sprawling Hampstead Heath while southwest London boasts the beautiful Kew Gardens. A popular choice for Londoners and visitors alike, a walk along the South Bank is always a good idea. There's plenty to see along the way from the Southbank Centre to Tate Modern, and if the weather turns dreary, you can head into the BFI Mediatheque to watch some of the British Film Institute's movie archives for free. There are plenty of flea markets around every weekend in London, but the Hackney Flea Market in the heart of Stoke Newington's Church Street is one of the best places to get fine jewelry, vintage fabrics, and furniture—or just spend hours browsing through some items dating back hundreds of years. Both independent artists and antique collectors alike show off their stuff at this unique market, so you're sure to find something special on your visit here. Located just a few blocks away from the Blackfriars Bridge on the shores of the River Thames, the Thames Pulse art project was first lit up on March 17, 2017, and will be on nightly until March 16, 2018. Created by artist Jason Bruges, this light installations projects three patterns onto the Sea Containers at Mondrian London which are determined by using water quality data from the Thames. Corresponding data will be tweeted via the Thames Pulse account, and the billboard located at the Sea Containers will project data in real-time. London loves art, and as a result, a number of venues across the city put on free artist exhibitions every day of the week. If you're looking for something to do on a Sunday, consider heading over to the Untitled Bar for "Pretty in Punk X Julia Gorton" or the Science Museum for "Illuminating India," both of which are free of charge to attend. Converted for the winter into a cozy Moroccan-themed wigwam, the rooftop at the Queen of Hoxton is a great place to stay warm while enjoying fantastic views of the city skyline and chatting with friends over a drink. Although drinks will cost you a few pounds, hanging out in this temporary installation inspired by the Majorelle Gardens in Marrakech is free. London is full of artists, and as a result, the streets are full of art—no matter where you look. As the walls are constantly being painted then repainted by artists from around the world, you'll rarely see the same street art on two consecutive trips to the city. Art of this nature can be found throughout the city, though certain areas of East London like Shoreditch are extremely popular for graffiti. 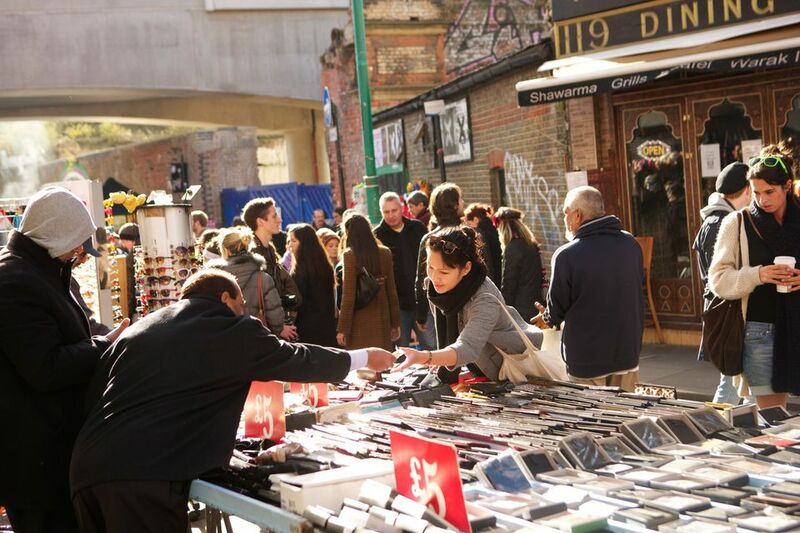 We recommend checking out Brick Lane, Middlesex Street, and Sclater Street. London has some of the most extensive collections of literature and most beautiful libraries in the world, so if you want to spend the day inside escaping to a foreign land or planning your next grand adventure, head to a local library. Completely free of charge, the best libraries for newcomers to the city include The London Library, the Senate House Library, and The British Library, each of which offers special programs for kids and adults, often with events on Sundays.